California Campus Compact designed the Community/University Initiative on Diversity, Equity, and Service (IDEAS) program,which focused on the integration of diversity and service-learning in higher education. The goal of the program was to encourage collaborative efforts between and across institutions around diversity and service-learning. By achieving this goal, we hoped to: 1) build the capacity of the independent sector of California higher education to increase focus on and integration of diversity and service-learning education and 2) prepare all students for participation and leadership in a diverse society. 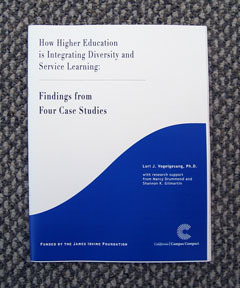 One major component of this project was a research study designed to examine issues of collaboration and how service-learning and diversity work might be more closely connected from an institutional perspective. Although this research project concentrated on four independent colleges and universities in California, we believe that the information gleaned from this study is informative for a variety of institutions. Funding was provided by the James Irvine Foundation.